Student explore how economists conduct cost benefit analysis to develop efficient emissions targets and set an emissions price (carbon tax) that is designed to help achieve that target. Students evaluate the EPA's Clean Power Plan in the context of Common but Differentiated Responsibility. This unit also introduces students to the idea that there are costs and benefits associated with the abatement of carbon pollution to curb climate change. Student explore how economists conduct cost benefit analysis to develop efficient emissions targets and set an emissions price (carbon tax) that is designed to help achieve that target. Evaluate the effectiveness of the Clean Power Plan at addressing the U.S.'s responsibility for global climate change. Explain why and how costs and benefits of carbon abatement are calculated by economists. Calculate the efficient level of global carbon abatement and the price of carbon emissions that can help achieve that target. This unit introduces students to two key economic concepts: costs and benefits of carbon abatement. This unit is useful at multiple levels for students of all disciplines; it can be used in introductory environmental studies and science courses, intermediate or advanced microeconomics or environmental economics courses and upper division geoscience and law and policy courses that use the module. This unit is designed to be carried out over one long class period (about 75 minutes). See teaching notes and tips below. a computer and projector to show the Unit 5 PowerPoint (PowerPoint 2007 (.pptx) 4.6MB May30 17) using the Unit 5 Lecture Notes (Microsoft Word 2007 (.docx) 148kB May13 17). 1. The following EPA Factsheet about the Clean Power Plan (CPP) to complete the in-class activity in Part 1. "EPA Overview of CPP fact sheet" is written for the general public. This informational brochure provides a summary of the Clean Power Plan: EPA Factsheet: Overview of Clean Power Plan (Acrobat (PDF) 629kB Feb26 16). Also available online at: http://www.epa.gov/cleanpowerplan/fact-sheet-overview-clean-power-plan. After a brief review of CPP, students conduct a SWOT analysis of the Clean Power Plan. 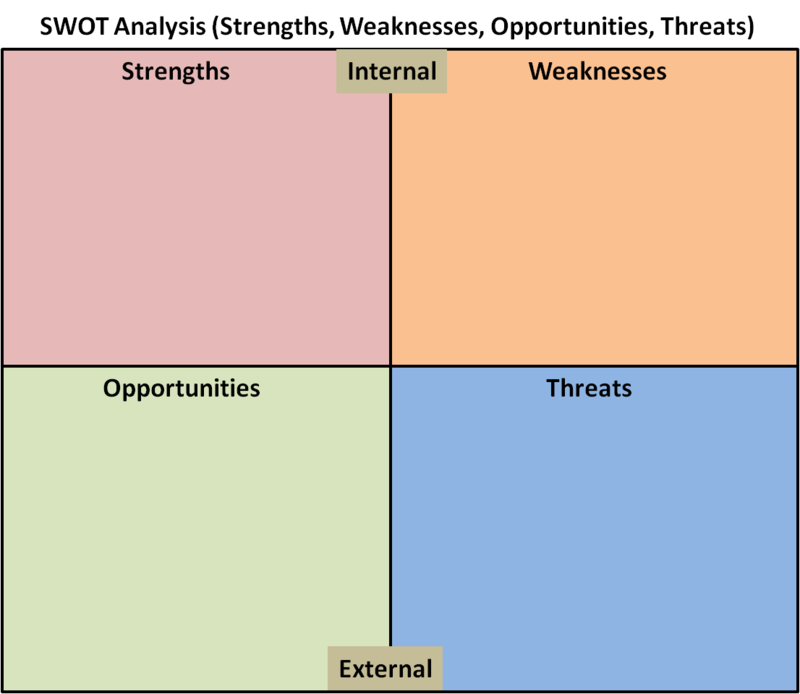 SWOT refers to Strengths, Weaknesses, Opportunities, and Threats. If you are unfamiliar with SWOT analysis can review this website. Instructors can print and hand out the SWOT analysis illustration provided here. Students should work with their partners to brainstorm characteristics of the Clean Power Plan and note them in the appropriate boxes. What elements of your SWOT analysis are you most and least confident about? How could you increase your confidence in your assessment of these elements? How easy was it/would it be to find credible sources that support or critique the Clean Power Plan? Do you believe the Clean Power Plan adequately addresses the U.S.'s responsibility for climate change and meets our obligation under the principles of CBDR? How we might abate (reduce/mitigate) carbon emissions? What kinds of technologies need to be developed and deployed? What kind of life-style changes need to be adopted? Note that implementing changes to avoid climate change also involve costs, which are called "abatement costs" in economics. What is the relationship between the social cost of carbon and the marginal benefit of abatement? How then does a change in the "climate sensitivity" and/or "harms" affect the shape and slope of marginal benefit of abatement? Emphasize that both costs---the cost of emitting carbon and the cost of abating carbon---need to be accounted for in policy-making. Cost benefit analysis is a process by which an economically efficient middle ground can be found. Students work in pairs or small groups to start the CBA Assignment (Acrobat (PDF) 128kB May13 17) and generate the Marginal Abatement Cost (MAC) curve for Brazil by following the steps in the Introduction to CBA (Acrobat (PDF) 730kB May13 17) they read before class. to the CBA assignment are provided. they will play in Unit 6, explain that the optimal amount of mitigation, also known as abatement, is determined by the quantity of abatement where the marginal benefit of abatement equals its marginal cost and the optimal tax is determined by the marginal benefit at the optimum abatement level, i.e. the height of the marginal benefit curve at the optimum abatement level. The webDICE activity outlined in unit 3 is an important prerequisite to understanding the concept of the "social cost of carbon," an idea that is covered in greater detail in this unit. It is strongly recommended that instructors conduct that activity before implementing this unit. The introduction to CPP on which the activity in Part 1 is based is at the end of Unit 4. Some students react adversely to the terminology "Cost Benefit Analysis"; instructors could use the phrase "Pros and Cons Analysis" instead. Learning Goal 1 is assessed informally through the SWOT activity above and formally in the module's summative assessment, an Op-Ed writing assignment (Microsoft Word 2007 (.docx) 90kB Nov8 16) introduced in Unit 7.
environment360. No date. Putting a Price on Carbon: An Emissions Cap or a Tax? Krugman, Paul. (2009) Unhelpful Hansen. New York Times, December 7, 2009. McKinsey & Company. (2009) Pathways to a Low-Carbon Economy. Orzsag, Peter R. (2007) Issues in Climate Change. Congressional Budget Office. Pew Center on Global Climate Change. (No date) Climate Policy Memo #1: Cap and Trade v Taxes. Climate Policy Memo #1. Stavins, Robert. (No date) Cap-and-Trade, Carbon Taxes, and My Neighbor's Lovely Lawn. An Economist's View of the Environment. Weitzman, ML. (1974) "Prices vs. Quantities." The Review of Economic Studies, 477--91. Unit 4: Towards Climate Change Policy in the U.S.
EPA Factsheet: Overview of the Clean Power Plan: Cutting Carbon Pollution from Power Plants. Accessed on epa.gov/cleanpowerplan on February 26, 2016.